Smartphones often get a bad rap these days as doing us more harm than good! Still, the fact remains that most of us wouldn’t be without one which means that when faced with an emergency, you don’t have to go anywhere to make a call and get an ambulance on it’s way. There’s also a few extra things you can do with your smartphone to make it even more helpful when someone (including you) needs medical help fast. 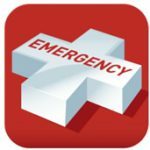 Go ahead and download the emergency + app now! It was developed in coordination with Australia’s emergency services to make it easy, not only to call the most appropriate emergency number, but displays your GPS coordinates and closest street address so you can quickly communicate your location. In 2016, iPhone’s voice activated assistant “Siri” helped a panicked Cairns mother save her baby who had stopped breathing, by calling triple zero when the phone had fallen and was out of reach [Full article]. Using her phone handsfree also allowed the mother to provide CPR without delay. Most smartphones now have voice activation, so it might just pay to learn how to activate it quickly in an emergency. Did you know that a bystander or paramedic could retrieve critical medical info about you and call your emergency contact person all from your phone’s lock screen? It’s easy to setup but the process differs depending on the phone you have. On iPhone, your Medical ID can be completed in the Health app (white icon with red heart). On Android phones, you should first try looking in your phone settings for ICE information under “My Information”. Failing that, there are apps for adding I.C.E. info, but you’ll need one that has a widget accessible from the lock screen. If you can’t set up ICE access from your lock screen, then at least update your phone’s contacts with your next of kin listed as ICE, so a rescuer can retrieve this number in the event that you can’t communicate this information. Brain injuries like concussion are a particular concern for children and those involved in sports. A brain injury is a medical emergency but they can be difficult to recognise. 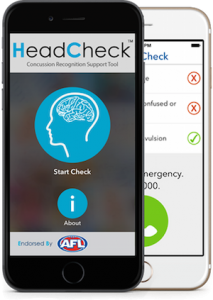 The HeadCheck app has been endorsed by the Australian Football League (AFL) and offers an easy systematic approach to assessing for brain injury using a series of simple questions. This is a very handy one for anyone going outdoors, particularly over the summer. 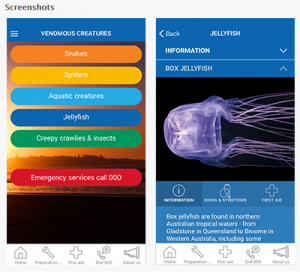 The app has been developed by the Australian Venom Research Unit (AVRU) and provides information about Australian venomous creatures, including photos, regions they inhabit, signs and symptoms of envenomation and specific step-by-step first aid treatment. Do you know other great ways to use your mobile phone in an emergency?